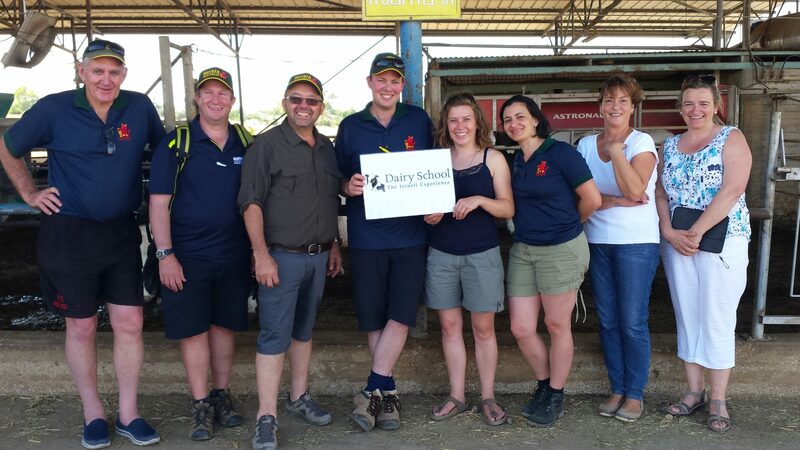 The Israeli Dairy School recently (22nd-24th June 2015) had the great privilege to host a 3-day visit by a group of scholarship holders from the internationally acclaimed Nuffield Australia Farming Scholarships. Nuffield Australia is a Non-profit Organization dedicated to improving all aspects of farming methods, by means of providing agricultural scholarships to a diverse cross-section of people involved in the agricultural industry. The delegation was led by James Geltch, CEO of Nuffield Australia Faming Scholarships, and included delegates from a variety of farming backgrounds, who have been awarded their Nuffield scholarships to study a wide diversity of agriculture-related subjects. These include bio-friendly pest control, farming finance, poultry welfare, dairy yields, laying yields, pasture productivity tools and, finally, the human element, or the importance of finding the right person for the job! Although our primary emphasis is on Israel dairy farming, most of the delegates have experience of crop, poultry and herd farming in their home countries, so we expanded our lecture topics to cover more general agricultural themes. We put together a busy and interesting 3-day itinerary for our guests, combining lectures, study tours and visits to tourist attractions. The program commenced with lunch at their hotel on Kibbutz Dgania Bet. The first afternoon was spent sight-seeing – the delegates first visited beautiful mountainous Golan Heights and enjoyed cherry picking , before returning to the hotel by 6pm for an introductory lecture on the History of Agriculture in Israel, presented by Ofier Langer, CEO and Founder of the Israeli Dairy School. After breakfast on Day 2 our guests went on a guided tour to Tiberias and Tabgha on the shores of the beautiful Sea of Galilee. In Tabgha we visited the Church of the Loaves and Fishes, the reputed site of the biblical miracle, from there we moved on Yardenit, which is a baptismal site for Christian pilgrims on the Jordan River. After lunch, the afternoon session featured a visit to Afimilk, who are world leaders in the manufacture of computerized systems for modern Dairy Farming and Herd Management. After learning all about how the Afimilk software can revolutionize your business, we moved on to Moshav Yavnial to see a family robotic dairy farm in action (including cheese making). We wound up the afternoon with a relaxing visit the Jordan River and Sea of Galilee for swimming. Delegates then returned to their hotel on the Kibbutz for dinner. The final day of the visit saw our delegates setting off on an early-morning study tour of Kibbutz Dgania Bet to learn how this large-scale Kibbutz dairy farm functions. In addition to dairy, this Kibbutz also produces tree crops from its banana, date, avocado and citrus plantations, which we also visited. After breakfast the delegates had a discussion with Trendlines, company that incubates innovation-based agricultural technologies, before leaving us for their travelling to the south of Israel and Jerusalem. The Israeli Dairy School is greatly honoured that such an internationally acclaimed organization chose us to host their delegation’s visit to Israel, and hope that the Israeli Dairy School will become a regular destination for both Nuffield scholarship holders and a wider sector of the Australian farming community. We are always delighted to share our knowledge and expertise with them, as well as show them some of the wonderful historic attractions of the Holy Land.